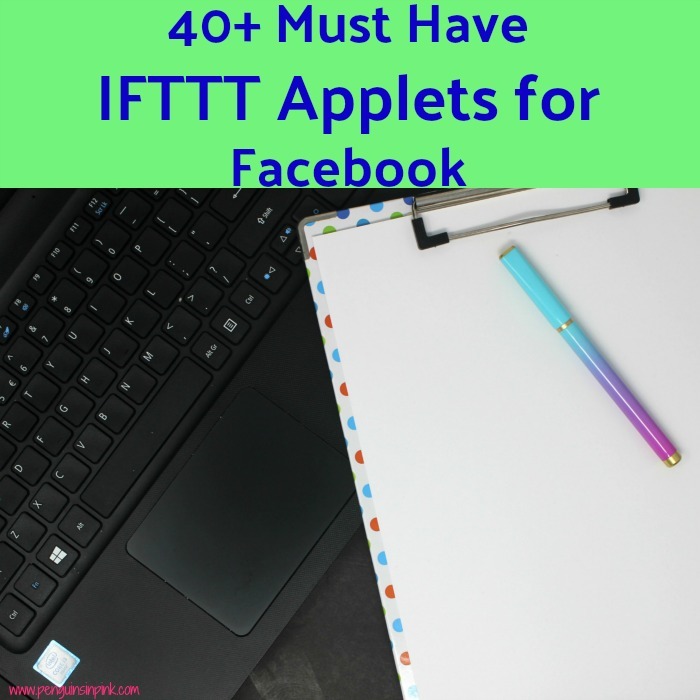 This post, 40+ Must Have IFTTT Applets for Facebook, may contain affiliate links. This means if you make a purchase through one of these links, Penguins in Pink will receive a commission at no additional cost to you. Facebook is a fun social media but like all the others it can be time consuming. I love using If This, Than That to automate some of my online life. 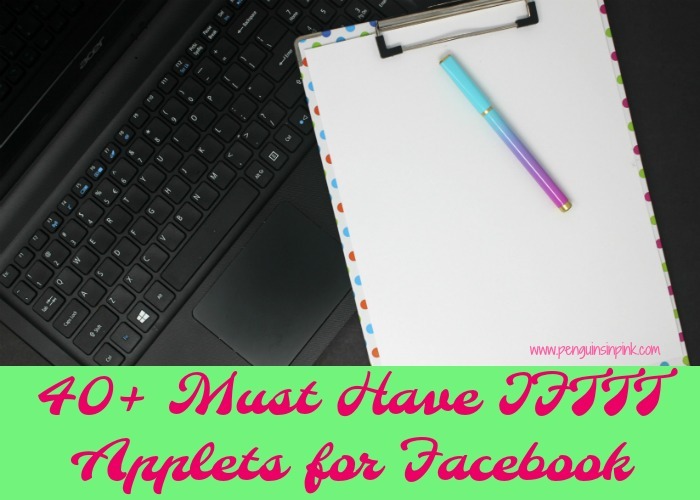 Today I wanted to share with you 40+ Must Have IFTTT Applets for Facebook. A few months ago, I shared the online tool IFTTT, pronounced like “gift,” to you with 10 IFTTT Applets for Bloggers that can help you automate your social media. The online tool IFTTT, pronounced like “gift,” without the g can help you automate your social media and so much more. IFTTT stand for “if this, then that.” IFTTT is a service that connects two unrelated services together using applets. Services are devices and apps that are connected together with Applets. IFTTT contains over 228 services you can connect together. Applets are connections between two devices or apps. Using IFTTT is very simple. Create an account for free and connect your apps and devices. The easiest way to connect your services is to go to the services list found here. Click on each service, click activate, and complete the authorization process for each one. Once all of your services are connected you are ready to explore the applets and start automating your social media and blog. Automatically share your new YouTube videos to a Facebook Page. Share your blog posts from Blogger to your Facebook Page. 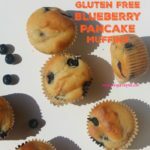 Share your Instagram photos To Facebook Fan Page. Automatically share your Twitter photos to your Facebook page. Share a link to your new WordPress blog post to your Facebook Page. Post new RSS Feed Items to Facebook. Stay organized and share all your Instagram pics to an album on your Facebook Page. When you add a Pin to a public Pinterest board, then repost to your Facebook page. Automatically share new posts from an business Instagram account as native image posts on Twitter, Pinterest, Tumblr, and your Facebook page. Share your Facebook Page photos to a Pinterest board when you include a specific #hashtag in the FB caption. Automatically share your page’s news with your LinkedIn followers. Every month post a message to your Facebook Page fans. Grow your audience by gently asking your fans to cross-follow you on Facebook and Twitter. Share new Tumblr posts on your Facebook Page. You can also switch it up by sharing your Facebook Page posts as links to Tumblr. Share all the posts on the Facebook page will be displayed over Slack channel. Automatically post on Twitter and Facebook Page when you start a Twitch stream. Share a link to your Facebook Page when you’re Periscoping. Adds your text status updates as an entry in a Google drive spreadsheet. Automatically post onto Twitter and Facebook Pages when you publish a Medium post. Automatically save new photos you’re tagged in on Facebook to Google Photos. Save new photos you post on Facebook to Google Photos. For iOS users, back up photos you’re tagged in on Facebook to an iOS Photos album. Automatically save new photos you’re tagged in on Facebook to Dropbox. Automatically uploaded new Instagram photos to a Facebook album. Don’t forget to automatically post your new Instagram videos to Facebook. Share new Flickr photo posts to an album on Facebook. For Google users, Post to Facebook by voice. Use Google Calendar events to automatically post birthday messages on Facebook. Don’t forget to thank your Facebook friends for wishing you happy birthday. If you recommend a story on Medium, this Recipe will share a link the story on Facebook for you. Every Wednesday, share a random Wikipedia article to Facebook. Want to easily create a morning message every morning? Then use create a Good morning greetings on Facebook! Easily post your Strava activities to Facebook. Save a track to “Your Music” on Spotify and tweet out the details and share them on Facebook. Automatically save links you share on Facebook to a Google Drive Spreadsheet. Post a new photo on Facebook with a specific hashtag it will be automatically Pinned to the board you choose. Keep your Twitter bio in sync with your Facebook bio. Share your uploaded videos on Vimeo to Facebook. Share your new RSS to Twitter, Slack, Facebook, & LinkedIn. Share NASA’s image of the day to Facebook and Twitter. Or share a NASA’s image of the day to your FB page. Automatically share the Quote of the day on your Facebook profile and Twitter. Share BrainyQuote’s nature quote of the day with your Facebook. Or automatically share it on your Facebook Page. Hit your daily steps on Fitbit? 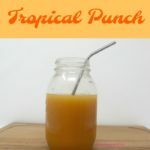 Share it with this recipe. 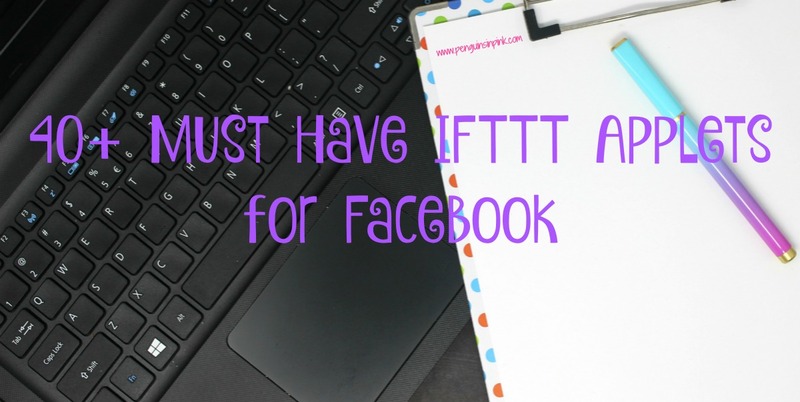 40+ Must Have IFTTT Applets for Facebook plus some fun ones too but there are many, many more. So go and explore IFTTT and see how you can put the internet to work for you. If you use Twitter make sure you check out these Twitter IFTTT recipes. Be sure to check out my DIY Blogging Tips page for all my blogging related posts. 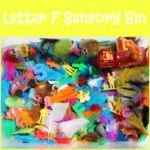 Just an FYI, I have no affiliation with IFTTT, I just really like their service and thought you would too. I hope that these 40+ Must Have IFTTT Applets for Facebook helps you and saves you some headaches too. I’m working on some more tutorials for the next few months. Is there anything you would like to see? Follow Penguins in Pink Blog’s board Blogging 101 on Pinterest.